I have 3 kids who are at a stage in life where they are growing like weeds. So I’m always looking for affordable ways to get their clothes, shoes, and even toys. That is why I absolute LOVE kids’ consignment sales and mom-to-mom sales. 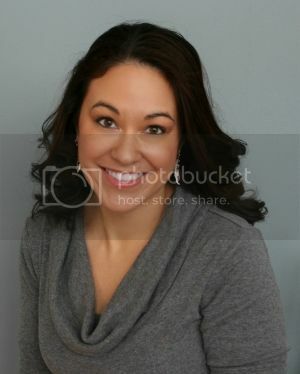 Over the past 3 years I have been a seller and a shopper in 6 kids’ consignment sales. Now I am getting ready for my 7th sale in a couple weeks. So I have learned quite a bit about what it takes for a successful sale. And I’m sharing what I have learned with you! This post will be focusing on tips for pricing to improve the chances of your stuff selling! If you want even more tips for kids’ consignment sales, click here to visit my main page where I link to EVERYTHING that I have learned. This includes tips for prepping items, shopping tips, and pretty much everything for you to rock the mom-to-mom sales in your area. Disclosure: For your convenience, this post contains affiliate links from which I make a small commission at no additional cost to you. The two biggest components of kids’ consignment sales are prepping your items and then pricing everything. Before you move on to these pricing tips, make sure you properly prep everything. 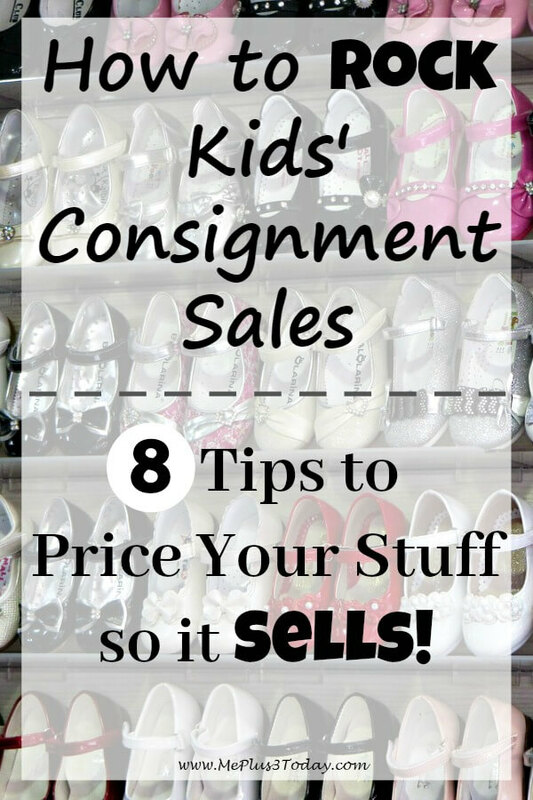 You can check out my Tips for Prepping Items for Kids Consignment Sales by clicking here. OK, so let’s talk about how to price your items so they will sell. When it comes to pricing for kids consignment sales, you need to strike a good balance between making money and having it sell. If you price too low, you might be missing out on some cash. However, if you price too high, then it won’t sell and you’ll be missing out completely. Seriously, it is really that simple. If you wouldn’t pay it, then why would anybody else? During my first sale I participated in, I looked at the prices and thought I had grossly underpriced my stuff. So for the second sale I did, I upped my prices, and it was my absolute worst sale. Once I thought about it, I realized that I didn’t buy the other stuff that I had looked at because of the high prices. And since it was still on the rack on the last day of the sale, nobody else was buying it either. Clearly it is much better to simply give your items prices that you would actually be willing to pay for them. Ever since my awful second sale, I set the prices at what I would pay. And I have been much more successful! I usually show up with a van piled full of stuff, and at the end of the sale I only have 1 or 2 storage bins to pick up. If you are still having a hard time deciding on prices, then mark it at 70% to 80% off the regular retail price that the item sold for when it was new. That might seem a little tough to swallow, but you have to remember that people who come to kids’ consignment sales are looking for a good deal. You also have to consider that the clothes are typically used. The toys are typically opened and played with. Other baby and kid gear has been well-loved. Even if they are in great condition, it is still a secondhand item which decreases its value significantly. Exception: Some toys and other baby gear items won’t always fit into this tip. However, the absolute highest I would price them is 50% of the retail price when it was new. In Tip #2 I mentioned the item being used. But with the way kids grow, you might have some brand new items they never even had a chance to use. It’s tempting to give these items much higher prices. However, you have to consider the brand and the store that it can be purchased from. Do they run sales or often have big clearance events? For example, you can often find clothes, shoes, and even toys marked down 50% to 70% at stores like Target, JCPenney, Kohls, or Old Navy. And most shoppers at kids’ consignment sales know this, so they won’t be willing to pay much more than that for an item. At the kids’ consignment sales I have sold and shopped at, there have been TONS of infant-sized clothes. This is basically anything 24-months and below, especially 3 month and 6 month. Babies just grow so fast that they hardly get a chance to wear their clothes, which is why there is such a big supply available. Plus, many people receive a lot of these size clothes at baby showers. With hand-me-downs from older siblings, there just isn’t as big of a demand for infant-sized clothes. Because there is so much competition in these sizes, it is best to price these items on the low end in order to sell. It may be hard to do when you know your baby only wore that outfit once, but it’s just another way to improve the chances of an item actually selling. It is pretty common that kids’ consignment sales will charge a fee and take a small percentage of your sales. This should only affect how you price a little bit. Set prices slightly higher than at a garage sale. But don’t go crazy and set them too high. Remember, it is still a secondhand sale. Most kids’ consignment sales will have a markdown day on the last day of the sale. Typically this means items with (or without) a special mark on the tag sell at 50% off the tagged price. I realize this may not sound enticing to you as a seller. But my thought is that I would much rather sell it for a discount and at least earn some money, than have to haul it back home and earn absolutely nothing for it. This is especially true for lower-priced items. A 50% markdown from a $3 item isn’t really that big of a hit in the long run. However, for higher-priced items, like a $40 stroller or playhouse, you might want to keep that at full price. The kids’ consignment sales that you participate in will have instructions on how to appropriately tag an item you want to remain at full price. OK, so this isn’t really a pricing tip. But it affects how much money you can make, so I’m including it here. Typically mom-to-mom sales allow you to earn a higher commission if you volunteer to help with the sale. There are usually plenty of options and times you can sign up for, including set-up, during the sale, and breakdown. My personal favorite is to work during drop-off so that I can see what is going to be at the sale before it actually begins. I sell at a Just Between Friends sale, which is nice because it has an online tagging system. I simply enter the size, description (optional), and price for each item into the system. Then I can print the tags on cardstock (there are 9 tags per piece of paper) to attach. I can also input whether I want the item donated at the end of the sale and if I want the item to sell at a reduced price on the markdown day. However, the kids’ consignment sales you choose to sell at may be completely different. I’ve shopped at sales where the information was hand-written on special pre-printed tags. I have also been to sales where there was no format and every seller just did their own style of tagging. So check the rules and requirements of your sale to make sure that you are pricing on the appropriate type of tags! 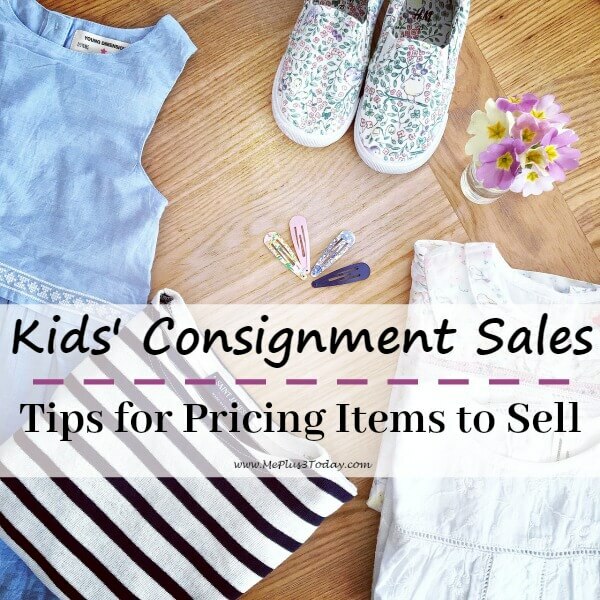 I hope you found these tips for pricing items help you rock as a seller at your kids consignment sales. Visit my Facebook page here http://www.facebook.com/meplus3today or tweet me to tell me about your experiences at kids’ consignment sales sales. 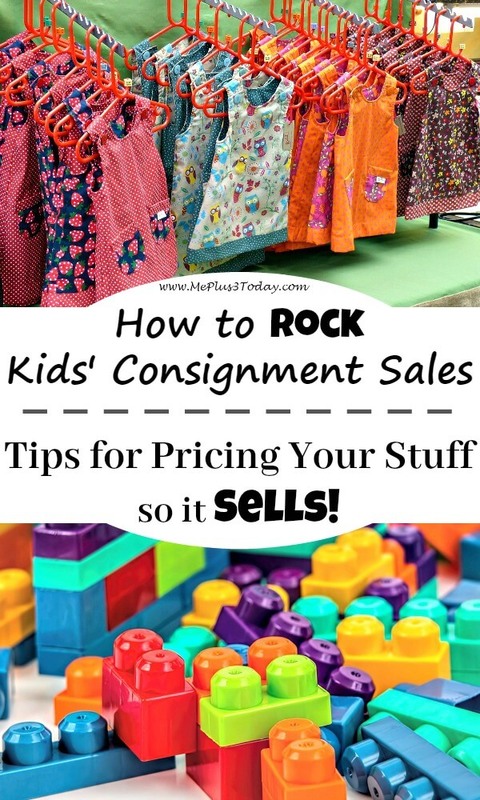 If you are looking for even more tips on how to rock kids’ consignment sales as seller and a buyer, then make sure you click here to check out my main page that connects you with everything I have learned! Tagged Budget and Money, Kids Consignment Sales, Mom-to-mom sales, Motherhood, Reduce Reuse Repurpose Recycle, Single Mom, Tips & Tricks. Bookmark the permalink.